A thief was force-fed 40 bananas as part of moves to retrieve a gold necklace he swallowed while fleeing from police. The man denied snatching the chain from a woman in the street in Mumbai and gulped it down as he was fleeing officers in a desperate attempt to conceal his crime. But X-rays showed what he had done and police in the western Indian city administered an enema which failed to yield the desired result. Doctors suggested an operation would be the best way forward, but police officers decided it would be too expensive and opted instead for the bananas. 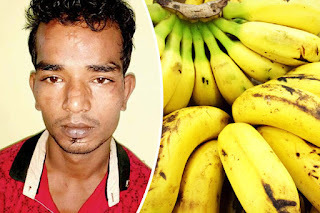 'He was fed more than 40 bananas throughout the day,' Mumbai police Senior Inspector Shankar Dhanavade told AFP. 'Eventually the chain was found. We made him wash and disinfect it,' the policeman added.